Courtesy of the Hershey Chocolate World factory ride, which I've done roughly 5000 times where their song still haunts my dreams occasionally (think "It's a Small World After All," only about chocolate), I didn't even have to look up what a chocolate nib is. It's the cocoa bean, before being ground and smushed down to cocoa liquor or butter. It's sorta like chocolate in its purest form that's in some type of edible state. All there is, there ain't no more. But I had to look up up again why dark chocolate is good for you - some, in moderation, is acceptable on my interpretation of the paleo diet (close to 50 pounds dropped now! ), and I've heard that there's benefits but have forgotten what they were. Well, about to drop some science on ya here: theobromine. Not related to actual bromine. What it does: Lower blood pressure. Helps you pee. Can even (maybe?) help prevent tooth decay. And it means "food of the gods." Not too much else you can ask from it, except for maybe some tax advice and to make Justin Bieber disappear forever. Darker the chocolate, the more theobromine, and since nibs are pretty much 100% dark chocolate, you can't do any better. Though you can buy and consume just straight cocoa nibs, that doesn't sound overly appetizing, at least not to me. So what can you add to pure chocolate to make it taste better? How about....more chocolate? Brilliant! 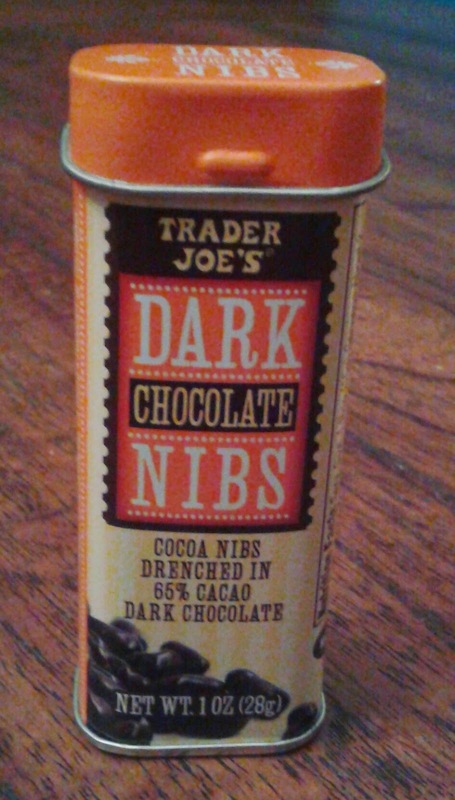 Hence the existence of Trader Joe's Dark Chocolate Nibs - nibs in a form that's palatable to the masses. Take a nib, bathe it in some 65% dark chocolate, put it in a tin by the checkout, charge $1.99, intrigue guys like me who'll gamble a couple bucks on a whim - good strategy. If you've done the chocolate-covered coffee bean thing, these aren't too far off that mark, they're just a little smaller, like the size of a large Nerd. Once your teeth sink through the cocoa-coating, it's just the crunchy nibby middle. Though it can feel a little gritty with a large mouth full, just a couple at a time are texturally pleasing enough. Now, 65% dark might seem like some pretty dark, bitter chocolate for some, but that outer layer is downright sweet compared to the actual nib. It takes a couple bites to really flush out the nib taste, and though there's not a lot, it's potent, the very definition of bittersweet. On one hand, I'm kinda surprised how much flavor can come from a toasted cocoa bean before adding milk and sugar and all that jazz - there's a slight nutty/fruity thing going on. Very slight. On the other, I'm not sure how much of just that taste I really want, so that little hit of "chocolate chocolate" from the outer layer adds a nice balance that helps smooth it all over. As an added bonus, the nibs come in a little pocket sized tin that I will have absolutely no practical use for, but will insist on holding on to anyways, much to the wife's chagrin. Speaking of the wifey, Sandy tried a small handful and wasn't overly impressed. "They just kinda taste like crunchy choco-bits, and I could eat all of these at once and not mind," she said. While I agree on the first part of her statement, I couldn't disagree more on the second. This is coming from a guy who loves dark chocolate and is still learning about things like "self control", but only like five or six of these bitty bits are enough for me when I need a hit. Seriously, I've had the tin for about a week, and there's still about a quarter of it left. Maybe the nibs have struck the balance of "good enough to keep eating, not good enough to do all at once" for me, or perhaps they're just a little too potent as is. Not sure. Matching threes from the two of us. I have seen these at the checkout... At least the canister is cute. Yes, a few suffice, and for someone who MUST have a hit of chocolate after two out of three meals, this tin of nibs is handy to carry around. They should be savored and will not give you the sweet thrill of— say— a tootsie roll or a Hershey's kiss. They feel like I'm eating chocolate in its purest and most healthful form. For me, a thumbs up. $2 for an ounce is pretty high, but I always have these on hand. Once in a while, I grab a Tic-Tac size serving. The can says it's about 2 servings, but it's about 10 for me. Watch out for heat and sunlight in summer; the tin heats up and the contents melt easier than a dark chocolate bar would.